December | 2009 | NICE! Photographers group in China. Very simple, I like the desaturated grid of photos on the homepage – which all change with time, with pretty slick animations in the zoomed in view. Also love the way the backdrop / icons change when the photo is dark/light, pretty cool. Created by Onetothree and think simple act simple. Site promoting the new handset from Emblaze. Very cool intro video followed by a futuristic / sci-fi esque site. 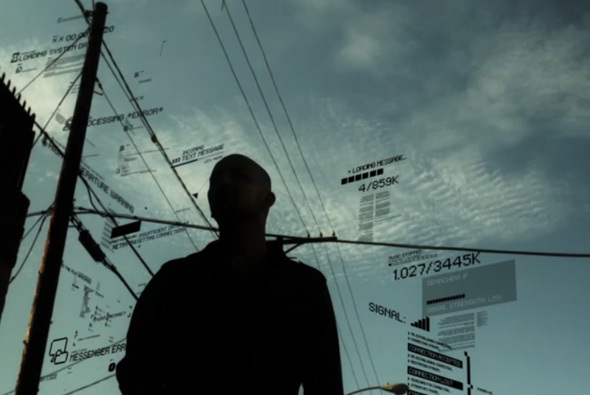 Lots of nice motion graphics in this one, with a quasi cinematic feel. Some nice touches and animation, all with a nice attention to detail. Created by The Visionaire Group. 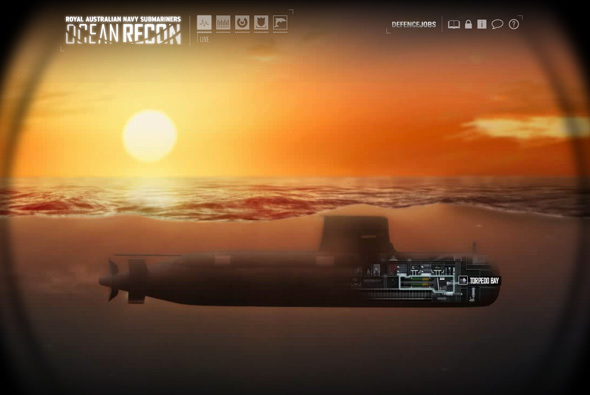 Promotional site highlighting life in a submarine with the Australian Navy. The level of detail is quite amazing, with high production values – the whole site is set from a side profile cut open view of a Collins Class submarine. You see how submarine operations are handled by specific people and what roles they have. Lots of video and small mini games demonstrate certain tasks – emptying the ballast tanks, or identifying radar contacts and so on. A very immersive experience, full of video and sounds – it also looks great, with loads of really nice touches – icons, animation and so on – great to see such a well polished production. Portfolio of Danish artist Kenneth Elgaard. 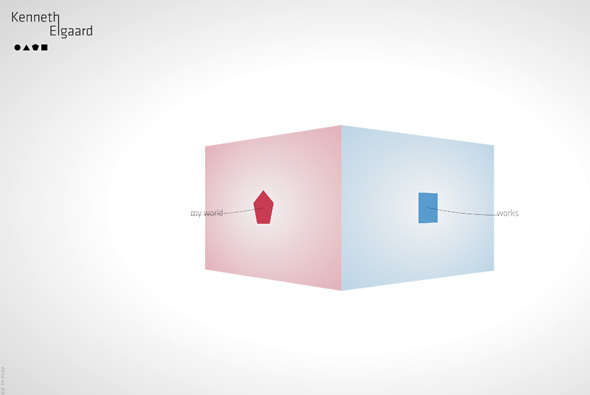 Clean and minimal, drag based interactivity – set around a cube with each side a different section of the site. What I like is the way you navigate the portfolio, by dragging along you view the work, and by dragging up and down you zoom in and out. All makes for a fluid, easy to use experience. Created by I Like to Play. Site of Timo Weiland fashion designer. Nicely designed and a little bit unusual, I like the way it has been laid out, and each time you navigate to a new section everything re-arranges itself. All in all quite a unique and fun experience. 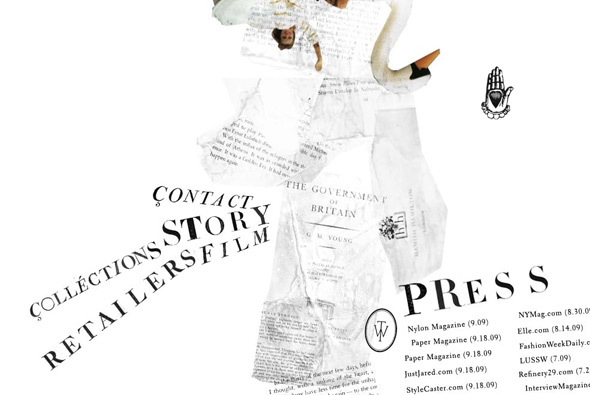 Cool little site, portfolio of the talented designer Freeger, lots of Russian work. 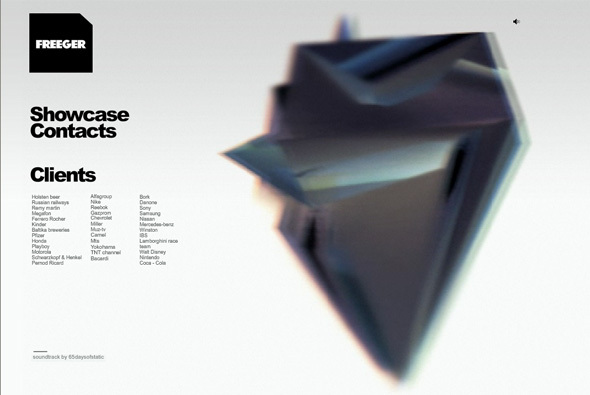 Love the amorphous shape on the front page, very simple but effective showcase of some really great work. Site highlighting Naoki’s range of sportswear – “NAOKI is a unique sportswear collection designed by NAOKI TAKIZAWA, a designer renowned in the Paris fashion world as the decade-long creative director of ISSEY MIYAKE”. 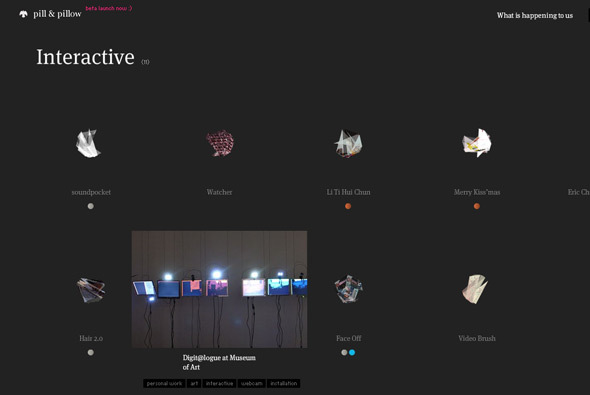 A nicely balanced, clean minimal site, with rotating 3d panels showing the range of clothing. Clicking on one shows an overview where you can smoothly zoom in and out. Nicely designed and executed with some really nice animation and interactivity. New portfolio site of Hong Kong based agency Pill & Pillow. Very simple with some nice touches, a Flash based, blog esque layout with tags and social content, pulled in from sources such as YouTube. I like the 3d screwed up balls of paper that represent their projects and the way they reveal, also some really nice work in here, lots of experimental work too. Well put together and looks pretty cool and minimal.